Burnley have surpassed all expectations placed on them this season and midfielder Jack Cork couldn’t be happier. 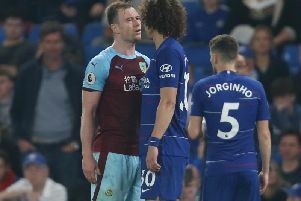 The Clarets already had their entry in to the qualification stages of the Europa League ratified ahead of their visit to the Emirates on Sunday, with Everton’s stalemate against Southampton at Goodison Park determining that the gap to seventh was insurmountable. Sean Dyche’s side suffered the heaviest defeat of his reign on Arsene Wenger’s farewell, with Pierre-Emerick Aubameyang’s double doing the bulk of the damage while Alexandre Lacazette, Sead Kolasinac and Alex Iwobi adding to the scoresheet, but that won’t take the gloss off what they’ve done. “Everyone is really happy with it,” he said. “It would’ve been nice to come here and get a result after that but it’s a great achievement. Cork felt that their opponents rose to the occasion in Islington, crafting a performance befitting of Wenger’s time in charge of the Gunners, and it provided the visitors with one of the stiffest tests of the season. The 28-year-old, who is the only outfield player in the top flight not to have missed a minute of action, said: “It felt like it was one of the hardest of the season; even against Man City at times it didn’t feel like that. “It was a tough game but it was a big occasion and I think they were all wanting to get a good result for their manager. It was never going to be easy for us.